All of my previous wedding posts have been leading up to this one - Our Big Day!!!! I'm a DIY bride, so y'all bear with me. I think every detail is important. I could write about the wedding forever. Hey, I'm a DIY bride! Instead of trying to tell you all about it, I'll share our trailer. 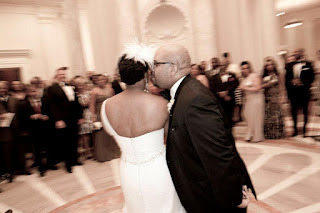 Shawn + Toya Wedding Trailer from Christian Villatoro on Vimeo. 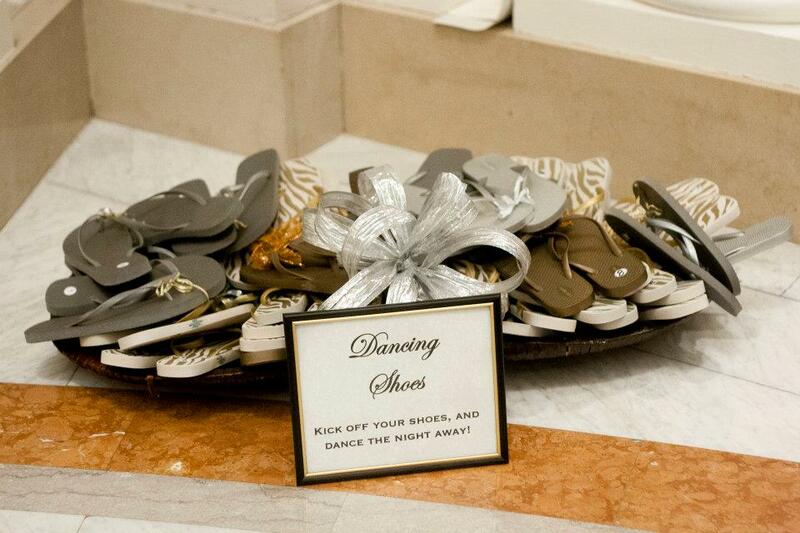 We figured the ceremony would be pretty emotional, so we wanted the reception to be all about fun. We planned a fun, music-filled party for the reception. My husband's friend from high school drove in from New Jersey to DJ for us. We both attended HBCUs in the mid to late-90’s, and used this as our music inspiration. Thanks to my hubby and our awesome DJ, the evening was filled with old-school hip hop and R&B. Being the hip-hop lovers that we are, we chose “Bonita Applebum” by A Tribe Called Quest as our first dance. In addition to all of the high-energy music, we had a photobooth with lots of fun props. Shawn and his Alpha Phi Alpha, Inc. fraternity brothers serenaded me and stepped a little for our guests. We also had an anniversary dance in lieu of tossing the bouquet and garter. Winners of the anniversary dance. 40+ years, and still going! How special it was to have my father marry us. I stood over him in a hospital bed 5 months before the wedding as he had a heart attack around Christmastime. Not only was he there, but he married us, and he cut a rug to Stevie Wonder's Isn't She Lovely, y'all. Click the link to watch him out dance me. Really, he did. How happy I was to watch my husband dance with his mother. She'd suffered a stroke in January so to see her wind it up to Bob Marley's Three Little Birds absolutely touched my heart. We are HUGE Lost fans. 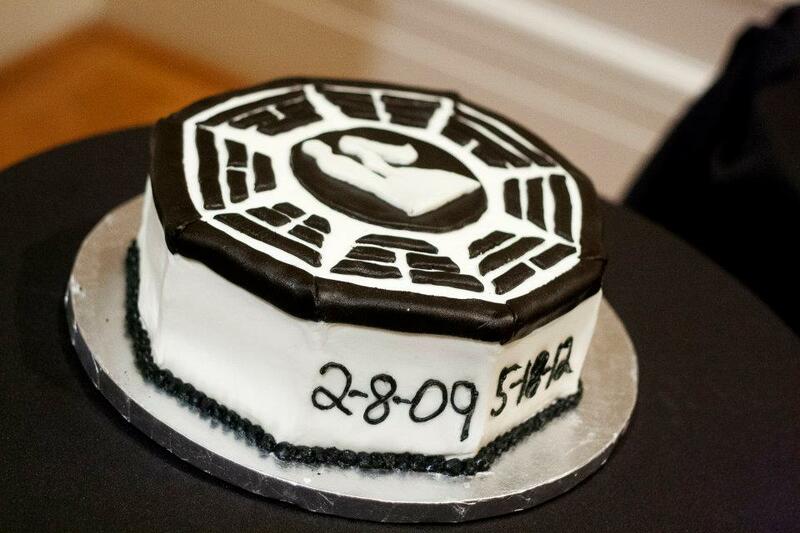 This was my nod to the Dharma Initiative. And the awesome string quartet that played everything from 2001 Space Odyssey, to Coldplay's Vida La Viva and Yellow, to Kanye West's Good Life. Yeah, the music was pretty eclectic but the strings made it all come together nicely. We're giving y'all the Rattler Strike in this pic. How good, no, GREAT venders make all the difference. As I mentioned in an earlier post, my day-of coordinator left much to be desired, but the rest of my vendors stepped in, and made my day amazing! Catering/bartending: Better Events Catering : There aren't enough kinds words I can say about Mr. Torres and his staff. They had worked the Carnegie before, so they had lots of great suggestions. People still tell us how great the food was. Mr. Torres and his staff are five-star. Photography: Marlo Herring Photography: Marlo was flexible and patient. He and his assistant Shane were amazing. I have so many great photos, so I really struggled with which ones to post. Floral arrangements/bouquets: Scentsational Events: Susan Songy at Scentsational Events was incredibly helpful. Because she was experienced with working in the Carnegie, she had great suggestions and ideas. Her rates were amazing! Videography: Fine HD Memories: Christian Villatoro and his crew were awesome. They captured so many intimate moments without being intrusive. They worked with us until we got the video and the trailer just the way that we wanted it. Cake: Be a Cake Star: Kelly the baker is great! She had an awesome cake-tasting presentation, and the cake . . . no words for how delicious it was. We couldn't just choose one flavor, so we chose 4 - one for each tier! Hotel: Rouge Hotel: The staff was helpful and courteous. The Rouge is a gorgeous space with a great events contact person. Plus, it's about 2 doors down from the Carnegie, so we saved costs on transportation. They made my elegant, swanky, city wedding come to life. Venue: Carnegie Institution of Science: The ladies who work the events at the Carnegie are really knowledgeable and helpful. They always welcomed me when I wanted to stop by to take measurements or try out some decor or just stalk the building. They coordinated with all of the vendors and were very helpful with set up and break down. Stationary: All That Jazz on Etsy.com: I talked all about Sophie and her gorgeous stationary here. She was so patient with me. She's so talented! Music: St. Charles Strings: I mentioned above how everybody loved the music during the ceremony. Neil and his colleagues were flexible and knowledgable. Their repertoire was amazing! My soloist came down with strep throat just days before the wedding, so they performed The Lord's Prayer with just a few days notice. Makeup: La'T Makeup Services: I told you all in my earlier post just how great it was to work with LaTanya. She created 11 different makeup looks on the day of the wedding. She was also just a great spirit to have around as I prepped to go down the aisle. Whew! Y'all still with me. After the wedding, we made our way back to the Rouge Hotel, where they had reserved a special room near the bar for an afterparty. Well, Hubs and I took a detour on our way to the afterparty. 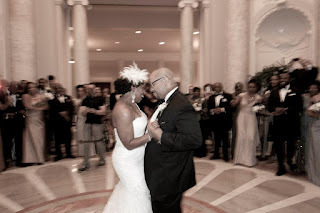 We continued the celebration with cocktails and cake, and my favorite DJ, my hubby, provided the sounds. Thank you for taking this long a$$ journey with me. Planning my own wedding was, by far, one of the most stressful things I've done in my life, but it was so worth it. I wanted to share so many details as a way of letting brides-to-be know that wedding planning can be hectic. Hell, it can even manic at times, but it all works out in the end. I still get a little feeling in my heart when we drive by the Carnegie. I love to drive by when there are weddings taking place. I can feel the energy! I will say this, though, when it was over, it was OVER! I'm just at the point where I can watch wedding shows on TV again. I stopped following wedding blogs. I detoxed, and now I'm excited about weddings again. Like, I'd love to plan someone else's (I think!). I can't think of a better way to feed my creative side than using my talents as two people pledge their lives to one another. Whew! Y'all tired? I am. These posts took forever to write!!! I'm writing this post on the eve of our anniversary. Hubs is all tucked away and in a food coma from our pre-anniversary dinner, and I think I'm gonna join him. Though I probably won't talk about wedding stuff in this detail EVER again, I'll probably come back from time to time with some wedding tips and ideas. Blogs were the best thing that ever happened to my wedding in terms of being inspired. Maybe I can do the same. I know for sure I'll write a post for brides-to-be. After losing sleep, losing hair, and getting a stye two days before the wedding, I think I can offer a few encouraging words. I crossed over, y'all! Until next time . . . I'm off to the country to a bed & breakfast with my husband to celebrate! See y'all next week! Many thanks for your kind words and shout out! It looks like it was such a fabulous wedding. The flip flops were such a great idea! Congratulations on your first year. I'm so happy for you! What a blessing! Your wedding was beautiful. We got married at the courthouse in 2005 and we plan to have a nice wedding for our 10 year anniversary. I say I want one but when I start to think about all of the planning and money sometimes I just think a destination vow renewal will do. We'll see! So glad to hear your father is doing well. I can't imagine how amazing it was to have him marry you. Oh, you are a Rattler too!! Yes Ma'am we roll deep and proud! I told my husband the only way I'd EVER renew our vows is destination style. Let somebody else do the legwork!